promising material for preparation of γ-alumina. tive technologies for producing alumina [2-4]. spacecraft, and abrasive and thermal wear coatings . with the sample consisting of γ- and χ-alumina . 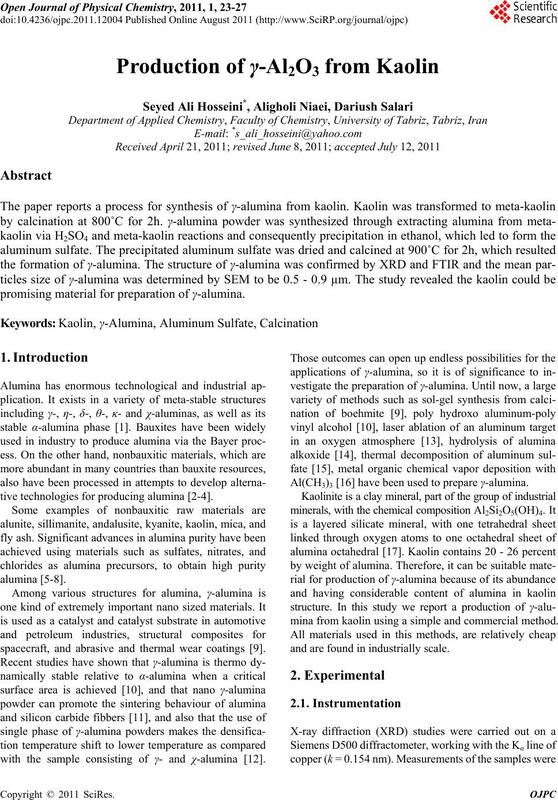 Al(CH3)3  have been used to prepare γ-alumina. mina from kaolin using a simple and commercial method. and are found in industrially scale. 24 S. A. HOSSEINI ET AL. X-ray fluorescence spectroscopy (spectro MIDEX). and with distilled water and then dried at 70˚C for 10 h.
Table 1. 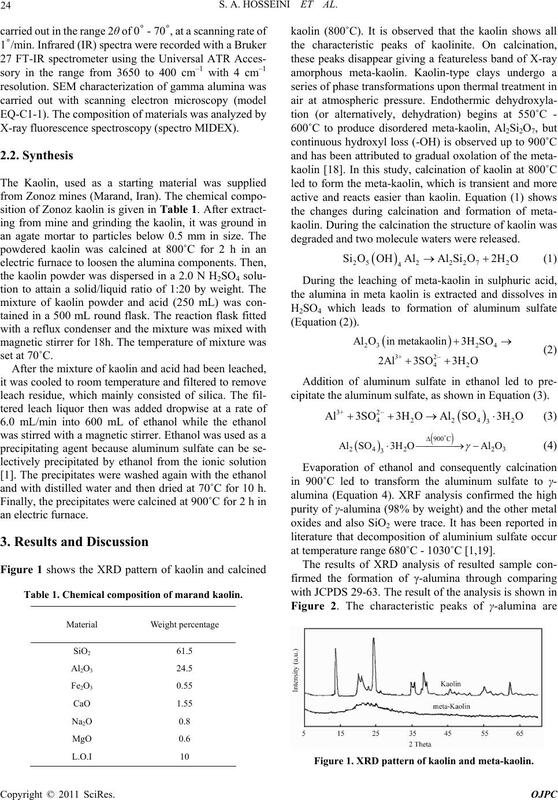 Chemical composition of marand kaolin. degraded and two molecule waters were released. cipitate the aluminum sulfate, as shown in Equation (3). at temperature range 680˚C - 1030˚C [1,19]. Figure 1. XRD pattern of kaolin and meta-kaolin. S. A. HOSSEINI ET AL. ions, silicon and phosphor or a combination of both . 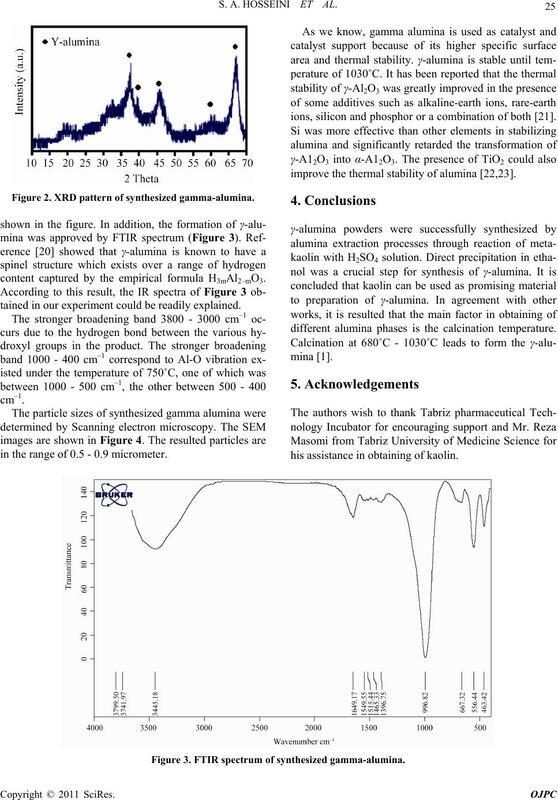 improve the thermal stability of alumina [22,23]. content captured by the empirical formula H3mAl2–mO3. tained in our experiment could be readily explained. different alumina phases is the calcination temperature. his assistance in obtaining of kaolin. in the range of 0.5 - 0.9 micrometer. Figure 3. FTIR spectrum of synthesized gamma-alumina. Figure 4. SEM image of synthesized gamma-alumina. rials Letters, Vol. 62, No. 20, 2009, pp. 3552-3554.
gist,” Chapman and Hall, New York, 1983. Vol. 64, No. 8, 1981, pp. 436-443.
letin, Vol. 63, 1984, pp. 799-804.
the American Ceramic Society, Vol. 65, No. 9, 1982, pp. G. Paglia, C. E. Buckley, A. L. Rohl, R. D. Hart, K.
Method,” Journal of the Ceramic Society of Japan, Vol. 111, No. 1294, 2003, pp. 419-425.
can Ceramic Society, Vol. 75, No. 12, 1992, pp. 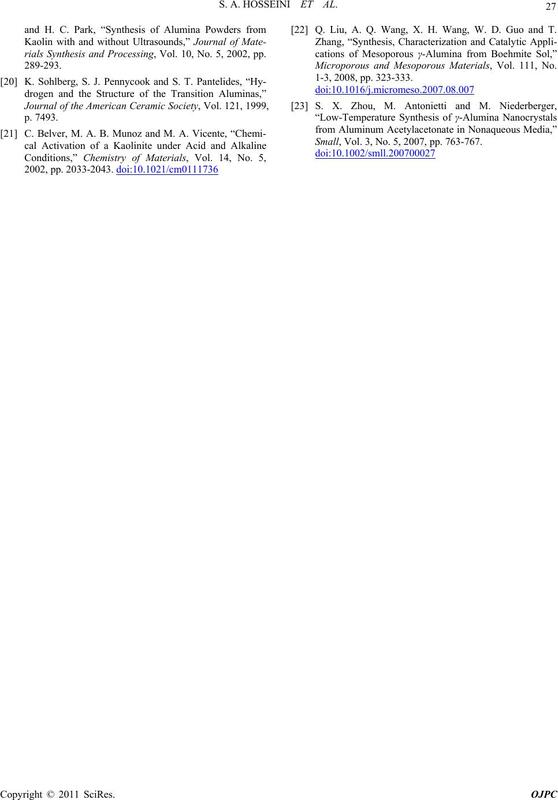 T. Ogihara, H. Nakagawa, T. Yanagawa, N. Ogata and K.
Ceramic Society, Vol. 74, 1991, p. 2263.
ciety, Vol. 64, 1981, p. 436. Chemistry of Minerals, Vol. 22, No. 4, 1995, pp. 207-214.
rials Synthesis and Processing, Vol. 10, No. 5, 2002, pp. 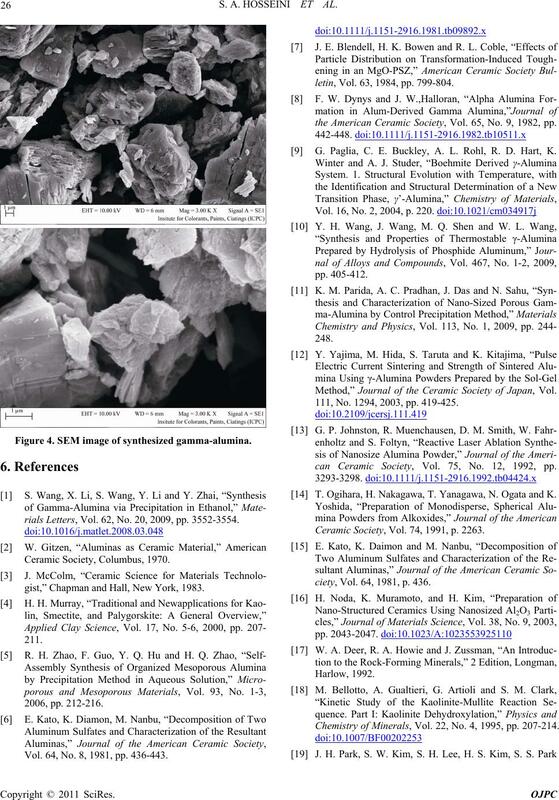 Q. Liu, A. Q. Wang, X. H. Wang, W. D. Guo and T.
Microporous and Mesoporous Materials, Vol. 111, No. Small, Vol. 3, No. 5, 2007, pp. 763-767.